The map shows one alternative studied for the bus lane project. Staff from Metro, in partnership with the city of Los Angeles and the county of Los Angeles will recommend the best alternative for the project later this year. The draft environmental impact report for the Wilshire peak period bus lane project has been released and is now posted online. It’s a big step toward completing the project, which Metro officials hope will happen in mid- to late 2012. 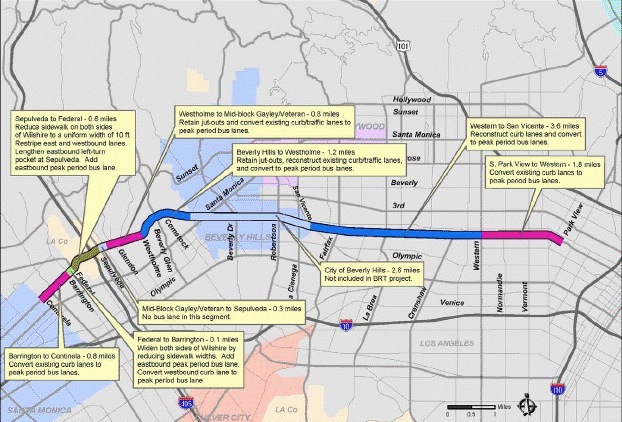 Here’s a post from last week that explains the project, which would add rush hour bus lanes to about 9.7 miles of Wilshire Boulevard in the city of Los Angeles and cut bus travel times significantly, according to Metro officials. The draft environmental study is very long, as these things always are. Public meetings are now scheduled to discuss the report — I’ve posted them after the jump. With increasing average daily traffic volumes on Wilshire Boulevard, demands for viable alternatives to the automobile have increased as congestion continues to slow automobile travel. This same congestion also slows buses, increasing travel time, and reducing schedule reliability for transit customers, while increasing operating costs for Metro. Average bus speeds, along with automobile speeds, have declined steadily over the past 20 years. The Wilshire BRT Project is intended to further improve bus passenger travel times, service reliability, ridership of the existing Wilshire BRT system, and encourage a shift from automobile use to public transit. Metro’s Metro Rapid Program provides fast, frequent regional bus service throughout Los Angeles County. Key features of Metro Rapid include simple route layouts, frequent service, fewer stops, low-floor buses to facilitate boarding and alighting, color-coded buses and stations, and traffic signal priority. The program’s success has garnered national acclaim from both the federal government and major transit providers. Launched in June 2000, the Wilshire/Whittier Metro Rapid Line 720 was one of the first two Metro Rapid Bus Rapid Transit (BRT) lines to be implemented in Los Angeles County. It demonstrated that by implementing a few key attributes as mentioned above, passenger travel times could be reduced by as much as 29% and ridership increased by as much as 40%. Metro Rapid Line 720 currently serves Wilshire Boulevard from 4:00 a.m. to 1:00 a.m. weekdays, with service every 3 to 4 minutes during the peak hours. There are currently 51 buses operating during the peak periods on Metro Rapid Line 720. Wilshire Boulevard is also served by Local Line 20 and Metro Rapid Express Line 920. Local Line 20 operates 24 hours a day with service every 6 minutes during the peak hours, and up to 29 peak buses. Metro Rapid Express Line 920 operates every 6 to 7 minutes during the weekday peak hours only. The same level of service along Wilshire Boulevard is planned post implementation of the Wilshire BRT project. Construction of the proposed Wilshire BRT project would not only assure the corridor’s immediate and long-term success as a BRT facility but would further enhance all transit services along Wilshire Boulevard. When implemented, bus passenger travel times are expected to further improve by an average of 24%. Average Metro Rapid bus speeds are projected to increase by an average of nearly 32%. Up to a 10% mode shift from mixed flow to bus use is projected. The draft study also looks at impacts on traffic flow along Wilshire that would result from the bus lanes. Generally speaking, most of 74 intersections along or near Wilshire would not be significantly impacted, but it would take motorists longer to get through nine of the intersections that can’t be fully mitigated. Served by Metro lines 20, 720 and 920. Parking is available in the lot on Lucas Av, between 6th St and Wilshire Bl. Parking is not validated, and costs $8. Street parking is available on Corinth. Served by Metro Line 4 and 704. ADA Requirements: Special accommodations are available to the public for Metro-sponsored meetings. All requests for reasonable accommodations must be made at least three working days (72 hours) in advance of the scheduled meeting date. Please telephone the project information line at 213.922.2500. Our TDD line is 1.800.252.9040. A copy of the Draft EIR/EA is available at metro.net/Wilshire and at public libraries in the study area. By clicking on Contact Us.